Early last fall I was sitting on my front porch enjoying being home from a long stint in the hospital. The sun was out and hummingbirds hummed in the vines on either side of the the stairs. One of the hummingbirds flicked in front of my face and stopped mid-air, wings buzzing. He hovered there for a while. I looked at him, one of his eyes stared at me. He seemed to hover a long time. He looked at me; I looked at him. He was welcoming me back to life. I was happy. Then he flicked over to a red flower. After I’d soaked up the fresh air I went inside to find out the name of the bird. He was either a Ruby-throated hummingbird or a nano AeroVironment spy drone. 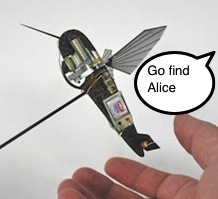 DARPA (don’t ask me) spent $4 million dollars and eleven years developing a drone that looks and flies like a hummingbird with a camera behind its eye. Now I wondered if my insurance company was checking that I wasn’t training for a marathon instead of just getting back on my feet. I wouldn’t feel as bad if drones were used to save lives during war, but how many Ruby-throated hummingbirds are in Afghanistan or the Gaza Strip? One commentator noted that if they flew one in New York City, people would stop and point, “Oh my god! Look! A hummingbird!” Not very stealth. There’s something about taking one of the most fragile, luminescent and magical animals and using it to spy on us. Another crack between the worlds of war and nature. I was so moved by that moment on the porch that I needle-worked a hummingbird pillow and ordered a small bag from the Nature Conservancy with a hummingbird on it. That moment was a sacred moment. Death had been close that year. It was pushed away so I could take in sacred moments with birds and trees and neighbors a while longer. Damn (or thankfully) I still can’t think of a hummingbird without thinking of that drone.